- Multiple points of dialog indicate that Nestor cutting off power to the Graystone house would also disable their cell phones, an implausible idea. - This episode establishes that Fidelia Fazekas is the Guatrau's daughter. - When Zoe refers to the proposed body for her as a "skin job" this is actually a reference to BSG's humanoid Cylons who are commonly referred to pejoratively as "skin jobs." - Evelyn has a brother who lives on Tauron. - Amanda and Daniel being attacked by some sort of virtual dragon. - The Guatrau authorizing a hit on Joseph and Sam. - Ruth killing Francis with a butcher knife. Ruth to Joseph: "I never liked that one. I'll call your brother." 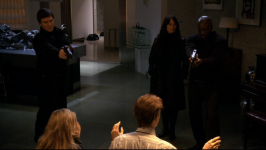 - Ruth: "The Guatrau send anyone after me..." She picks up a shotgun. Ruth: "Safe journey!" - Clarice, Olaf, and Nestor staging an all out assault on the Graystone house. - Serge getting shot to death! - Amanda taking out Sam in V-World. - Odin turning on Diego and Kevin only to discover that they gave him an unloaded gun. - Odin's and Lacy's friends turning on Diego and Kevin, in effect staging a coup against the STO leadership. - Lacy declaring that they should stay on Gemenon and use the Cylons to seize control of the STO rather than run. - Daniel and Amanda finally locating Zoe in V-World and beginning the reconciliation process. - Daniel and Amanda discovering that their house has been broken into upon removing their holobands. - Clarice, Olaf, and Nestor finally breaking into the room where Daniel and Amanda were holing up. - Daniel appealing to Clarice to help him know god to distract her to give Zoe time to once again inhabit the U-87 and intervene on his behalf. - Zoe in the U-87 killing Nestor. - Clarice and Olaf retreating after realizing it was Zoe who attacked them. - Daniel proposing to Zoe that they work together to build her a real body, complete with synthetic skin. - Willie intervening to save Joseph and Sam, getting severe gunshot wounds in the process. An almost perfect episode in the spirit of Retribution, offering nonstop action, ruthless tactics by our various antiheroes, and pitting multiple groups of equally sympathetic characters against each other. Also like Retribution's offing of Barnabas, a major recurring character is brutally taken out: Clarice's husband Nestor is the second life to be claimed by Zoe. The intense pace of the plot in this episode does much to reinvoke the tone of Retribution. For instance, in the teaser, the Guatrau orders Joseph and Sam killed and an assassin appears at Joseph's house in the very next act. While Clarice, Olaf, and Nestor are plotting their attack on the Graystone house, things move forward so quickly that it's easy to wonder whether or not the actual break-in isn't some kind of holoband simulation of their plan, especially when they take out Serge. But as it keeps moving forward without any signs of relent, any doubt that it's real is quickly eroded. The various iterations of their break-in demonstrates quite effectively just how paranoid the Graystones are about potential break-ins. The house is hysterically well defended. Multiple layers of bulletproof metal blast doors falling into place, Serge armed with weapons, and independent redundant power sources in case the city itself loses power even. All of these hilarious obstacles are set to the backdrop of Daniel's and Amanda's complete and total obliviousness to what's going on around them. Their adventure to reclaim their daughter in V-World quite appropriately adds to the comedy. The relative triviality of their quest which I noted in previous reviews is perfectly framed by this episode's plot. In spite of this, that story by itself manages to rise above its innate triviality to be a successful drama. I quite enjoyed that Amanda recognized Sam and simply took him out when he started to step out of line. I also enjoyed Daniel noticing the effect of Zoe's generative algorithms producing a more realistic V-World. But the core of the drama is the parents finally being reunited with their daughter and having a lengthy, substantive, heart to heart conversation with her. Real progress is made for all characters involved. Finally. Shortly thereafter, the first scene between the two best actors on the show, Eric Stoltz (Daniel), and Polly Walker (Clarice) doesn't disappoint. I absolutely loved Daniel trying to stall Clarice and her disgusted and somewhat confused reaction to it. Then seeing Zoe take out Nestor was even more brutally well done than Philomon's similar death in End of Line. Perhaps because it was willful rather than accidental. Finally, I was delighted that Clarice was able to recognize that it was Zoe prior to her... shall we say... strategic withdrawal. The one wrinkle in the Willow assault on the Graystone household was the short bit when Clarice talked to Amanda about how Zoe allegedly "talked to angels" which "guided her." This is a repeat of the similar worrisome hints from Things We Lock Away that the supernatural entity from BSG's ending is playing a direct role in Caprica's events as well. If this is indeed the case, we can no longer accept the idea that BSG's god only got involved once humanity had been brought to the brink of extinction by their creation as is implied by the events of BSG. Instead, we have to accept the far more annoying idea that it was god who originally created the artificial life in the first place by giving Zoe divine inspiration. In essence, it is god who has started the first and second Cylon wars. However, these hints so far are still just that. Hints. There's still no way to know whether or not there has been any actual supernatural intervention quite yet. Let's hope not. The other significant drag on this episode's otherwise copious amounts of splendor is its lame ending. The way Willie's final scenes play out, the directing strongly implies that he has died from his wounds. Assuming that this is not a lead up to some kind of divine intervention from god to save Willie (please, dear gods let that not be the case! ), then the ending is in essence a lie to the audience. And a bad one too, because we all know he lives. That said, Willie's story is not without its perks. Willie is not usually much of a significant player on Caprica, which is probably a good thing. However he has a couple of nice choice scenes. My favorite is his short shipbuilding endeavor with Evelyn. I quite enjoyed the fact that he'd rather be on a ship in V-World than wasting his time building what he saw as a stupid model when we all know that Willie as an older man quite enjoys the hobby of building model ships. Likewise, there's some nice foreshadowing that he would enjoy the life of a ship's officer when he stated that he wouldn't mind the lifestyle, nor being away from home for protracted periods of time. Finally, there's certainly value in the parallelism that poor Willie has so many near death experiences! All in all, Here Be Dragons is the best episode since Retribution. Were it not for a few minor flaws, it could have even been the best episode of the series so far. Nevertheless, it's still a very exciting ride.